Wouldn't it be great to have a national championship for spaniels where the handler actually shoots over their own dog? Not one of those ten pheasants, ten shells, ten minutes competitions, but rather, a realistic - and challenging - event where the well-trained spaniel can really shine. Hold it in what the winter-weary Northerners call the "dead of winter" at a warm, sunny location and you've got a winning combination. There is, in fact, such an event. It's the National English Springer Spaniel Shooting Dog Championship. 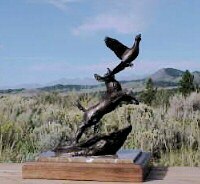 On February 1st and 2nd, 2003, the third annual NESSSDC will be, once again, hosted by the Victoria Bird Dog Club and it will take place at the historic McFaddin Ranch near McFaddin, Texas. When asked what inspired the formation of the NESSSDC, founder David Jones of Strong Gundogs in Tivoli, Texas, replies, "There were a number of reasons. I had always enjoyed shooting dog stakes. Gundogs Unlimited wanted to do a TV show on Springers so that accelerated the process. Plus there was a lot of bantering on the then new Internet lists as who were the best: Hunt-test dogs or Field Trial dogs. All were invited - including show dogs. Only the FT dogs showed up." The fun is not limited to just English Springer Spaniels. "Martin Bell campaigned for a couple of years to let the Cockers in." Jones explains, "I thought they would do very well and they allow them in Canadian trials with no problems - so we let them in." Will the number of entries be limited? "Yes. We draw the line at fifty," he replies. "Some of the Springer trials have become ridiculously large." Three series tests the dogs - and handlers, alike. The first and second are run in brace, flanked by gunners - similar to traditional spaniel field trials. The format changes in the final round. "In our competition," David Jones continues, "if you reach the finals, you will have 30 minutes to shoot over your own dog - on three species of game birds - with water retrieves as well." As in past years, pheasants, chukars, and quail will be used. "There is one thing for certain, we are not short of grounds. We have awesome cover with all the rains this fall." "I was amazed at what I saw - how many of our dogs really were in good enough shape both mentally and physically to run the course." Ground coverage, game-finding ability, flushing, marking, retrieving, control, teamwork, and gun safety are elements that factor into the judges decision. The caliber of judges that the NESSSDC has - and continues to attract - is quite impressive. In addition to Jones, alumni judges include: Ray Cacchio, Bob Bullard, and Janet Christensen. This years judges are Chad Betts of Kansas and Marty Knibbs of Saskatchewan, Canada. Both are well qualified with long histories of experience training, hunting, handling, championing, and judging gundogs - especially spaniels. From the start, the Championship has attracted prime competitors.